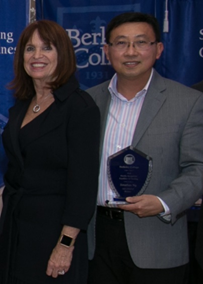 Photo Caption (above): Professor Jonathan Ng, PhD, Management, Berkeley College Larry L. Luing School of Business® (above right), receives the Excellence in Teaching Award during the 2018 Berkeley College Faculty Recognition Awards dinner, held on November 14, 2018, at The Terrace in Paramus, NJ. He is pictured with Elana Zolfo, PhD, Dean, Berkeley College Larry L. Luing School of Business. “To me, a great teacher has three essential characteristics – mission, passion and continuous learning,” said Dr. Ng. “A great teacher firmly believes in the mission of the school in empowering our students to achieve lifelong success, is passionate about teaching and developing our students, and continuously seeks opportunities to learn and improve his or her teaching skills and methods.” Dr. Ng is a resident of South Orange, NJ. Below (L to R) are: Eva Skuka, MD, Dean, Berkeley College School of Health Studies; Doris Alvarado, MD, Berkeley College School of Health Studies; Donald Kieffer, PhD, Dean, Berkeley College School of Liberal Arts; Michael J. Smith, President, Berkeley College; Beth Castiglia, PhD, Provost, Berkeley College; Jonathan Weidenbaum, PhD, Humanities and Social Sciences, Berkeley College School of Liberal Arts; Kevin Luing, Berkeley College Board Chairman; Elana Zolfo, EdD, Dean; Jonathan Ng, PhD, Management; and Ronald Boswell, Accounting and Finance, all of the Berkeley College Larry L. Luing School of Business®. Drs. Alvarado, Weidenbaum and Ng are all recipients of the Excellence in Teaching Award. Mr. Boswell is a recipient of the Commitment to Students Award.